Sharp edges? On the case or bracelet (or both)? That does look great - can you post some lume shots? Last edited by KAS118; 19th January 2019 at 17:55. Lume on the new Speedbird III is excellent! Mind you, the minute hand is a bit thicker than the old Speedbird's. This thing glows and lasts as good as my old Omega SMP Bond did. Sharp edges on the clasp really, edge of bracelet just a tad. I am terrible with lume shots but I see someone stepped up. 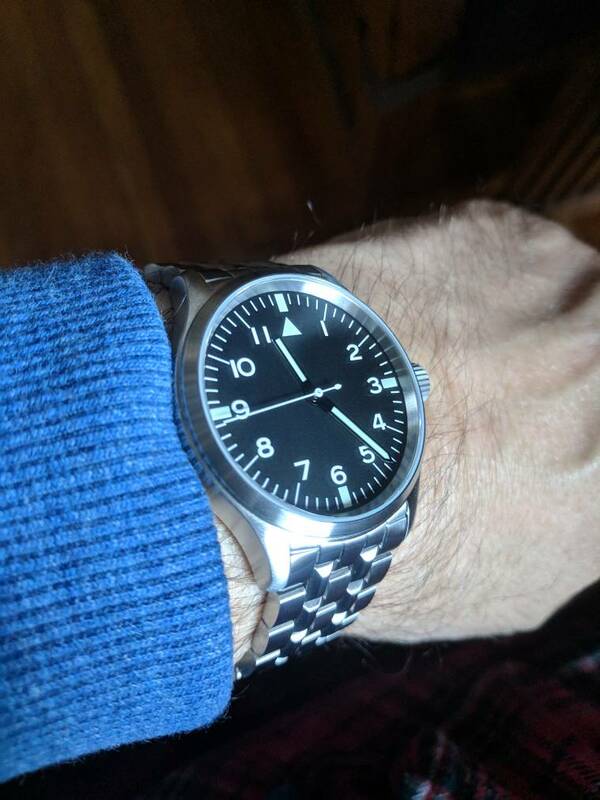 Any more wrist shots from lucky sppedbird owners? PRS-1 dial Speedbird III just arrived. It's been awhile since I've had a watch on a bracelet -- this is a very serious piece of hardware! I really like the look of that PRS-1 dialled model, very nice indeed. My PRS-1 dialed PRS-22 arrived yesterday but no wrist shots until I get the bracelet sized. 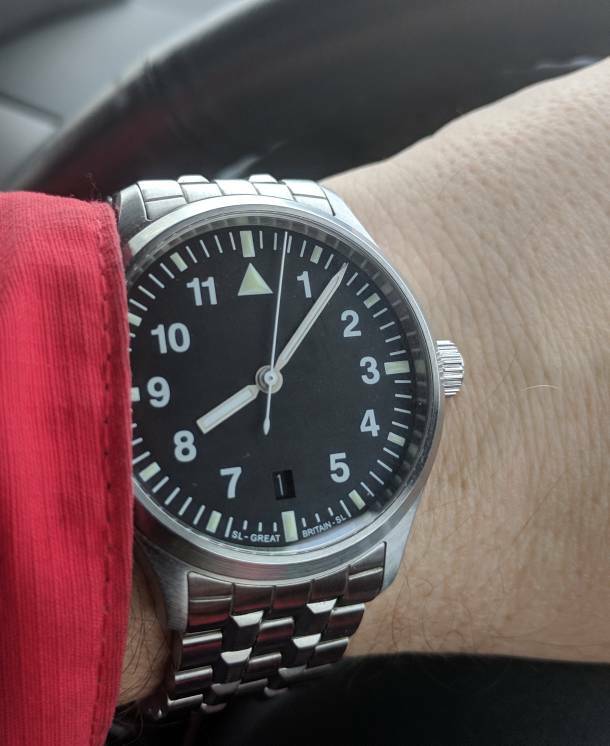 On a Damasko leather strap. Nice slim fit but I like the bracelet best I think. Bracelet sized and on the wrist. Very comfortable. I'm not a big bracelet guy, and I started wearing it with a Speedbird RAF strap. But the bracelet is so great I put it back on. The twin, narrow faceted links look really great. The extender/adjuster piece works really well, and i can work it with one hand without much difficulty. The comfort and build quality are really outstanding, especially considering the price. It's not perfect, though. The clasp housing on the non-extender end has some fit and finish issues: much sharper edges than extender end, and the end link doesn't quite clear the top of the underside when rotating. I was able to address both of these issues with a small whetstone, some masking tape, and about 30 minutes of work. If I'd paid 10-times as much for the watch, I'd be a bit disappointed. As it is, it gave me some extra DIY satisfaction. 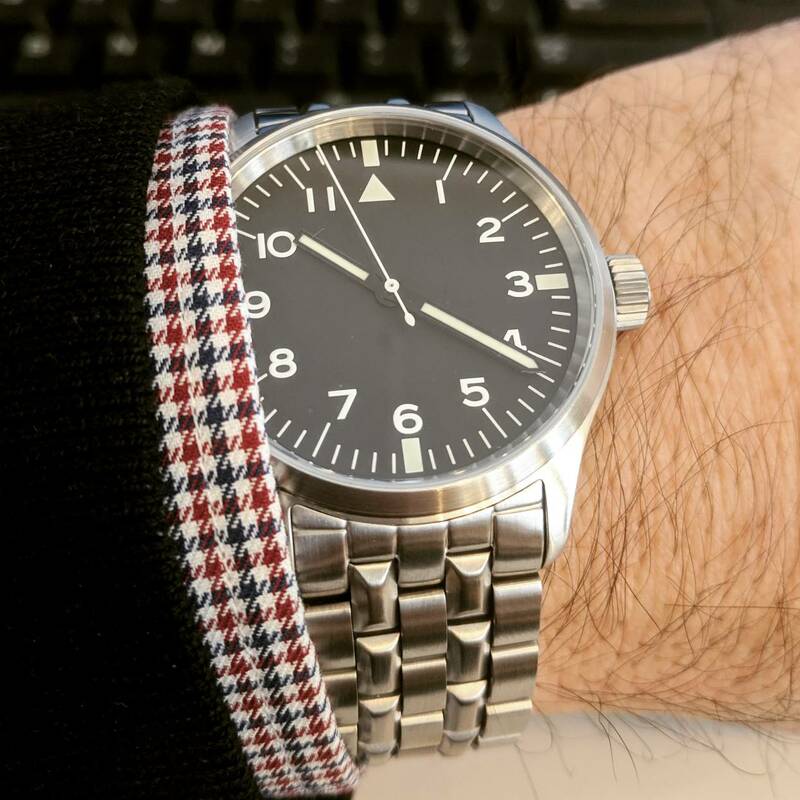 Overall, it's the best bracelet watch I've owned. Last edited by marschv; 17th February 2019 at 22:43. By 'eck I like that PRS-1 dial. Taken this morning. Just noticed that the date's wrong. I was in the local jeweller this afternoon dropping my Breitling off for some attention, and said jeweller said "Nice IWC"
I put him right, of course. Last edited by Gyp; 28th February 2019 at 20:36. Just had my Speedbird PRS-1 Dial with a Brady strap. 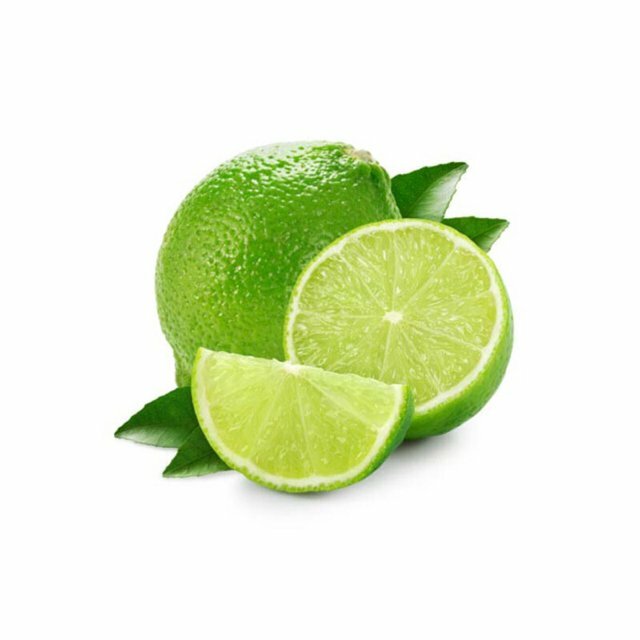 How do I post the picture in this thread? Here you go, looks good, . . . Thanks guys for helping with my pic. Wondering how the 20th anniversary Speedbird will be. 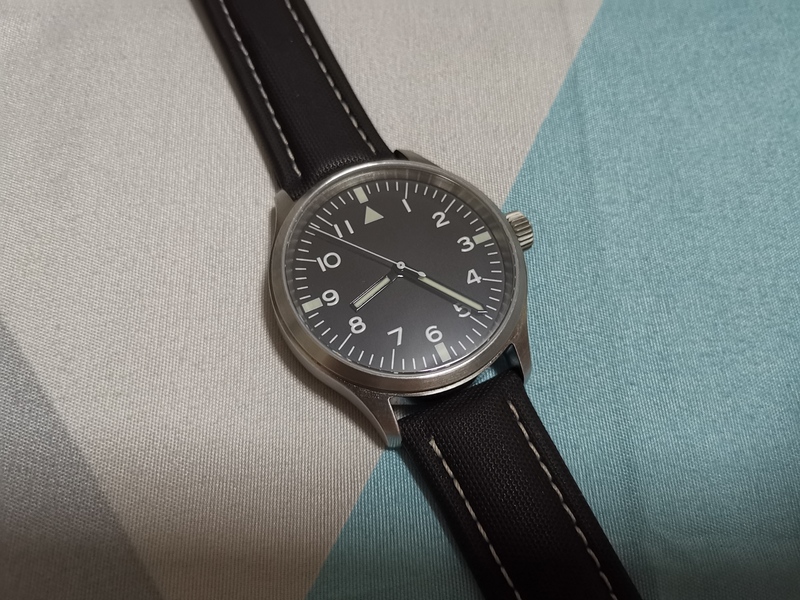 Titanium COSC edition with 'stealth' Speedbird logo on the dial? Just my suggestion. Thanks guys for helping with my pic. Wondering how the 20th anniversary Speedbird will be. Solid gold case and bracelet. Nooooooo. When I had the Dreadnought made by Fricker in 2003, I rather fancied an 18K gold version for myself. I forget the cost but it would have weighed a kilo. Not seen many pix of the new Speedbird III . Any new owners wish to share? Seriously considering getting one! Here's mine with the PRS-1 dial. 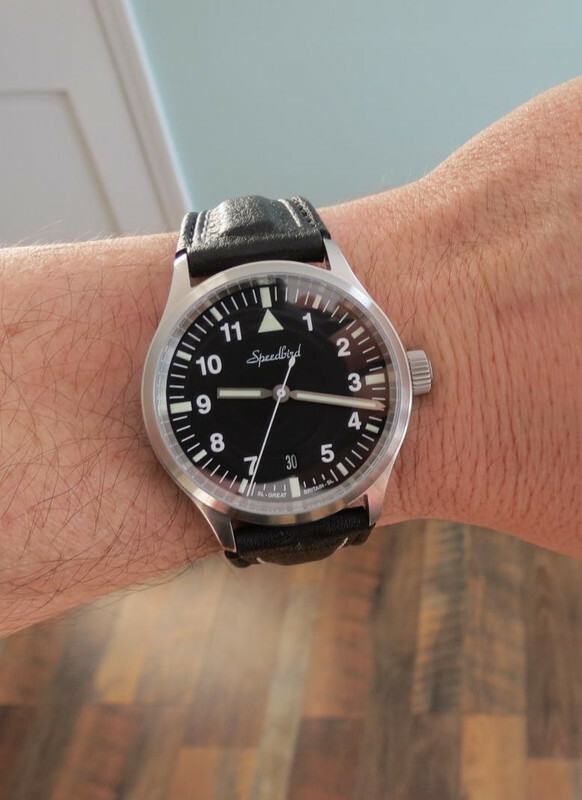 I've always wanted a no date flieger on a bracelet and this hits the spot. 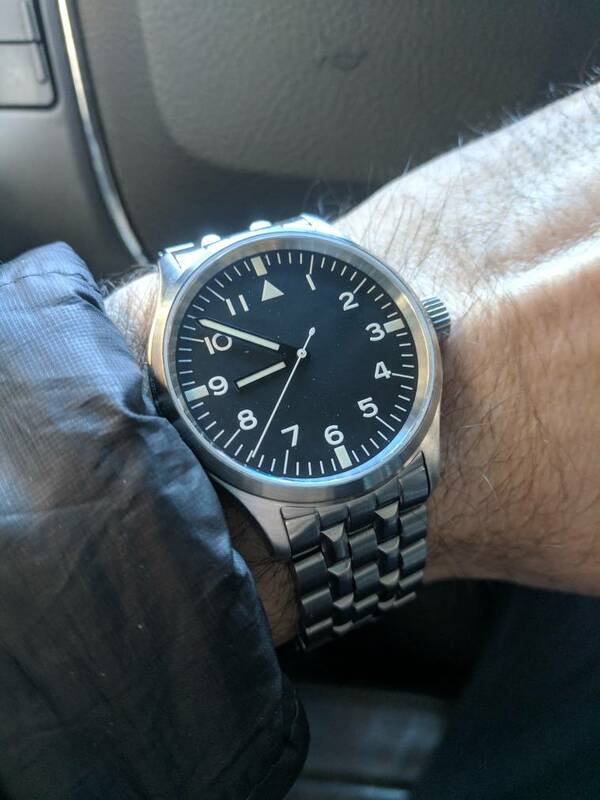 Any chance of a version with an off-white dial? And another. Very comfortable bracelet too.